Apple trees are hard to find in a size large enough to produce lumber, because the trees are usually pruned to keep the fruit low to the ground. When an American orchard has passed maturity, the trees are often bulldozed over and burned. American Apple trees produce some of the most fine-grained swirl patterns of any North American wood species. The apple tree is technically not native to North America; it was brought here by European colonists, but actually originates from Central Asia. Today, there are over 7500 types of apple trees. Most are grown for specific fruit characteristics. Note: The box pictured is made of apple wood. 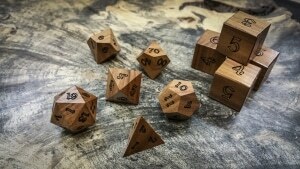 Apple wood dice will come in our standard dice box.